Why not let Phoenix Pharma Solutions create a consolidation platform for you? Whilst consolidation is nothing new, so far the pharmaceutical industry has been reluctant to consider this option. A lack of suitable warehouse space, tight delivery time lines and the need for compliance throughout the supply chain, has forced a lot of companies to ship on a dedicated basis. On top of this, the short lead time for reefer equipment already in short supply, can add an unnecessary premium to the cost of the shipment. Phoenix Pharma can provide a fully compliant consolidation platform providing you with a remote warehouse handling facility. Product is collected from your factory and delivered into our managed warehouse on temperature controlled trucks where it’s stored until you give instruction to load out. 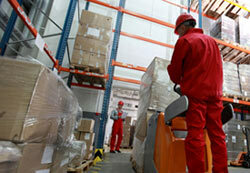 Several orders for the same delivery address can then be consolidated together and shipped out as one movement.